A false-color image of a rare early Quadrantid was taken by a NASA meteor camera in 2010. Meteor watchers in North America can expect to see 60 to 200 meteors an hour streak across the sky early Wednesday. NASA says the Quadrantid meteor shower should be perfect for viewing around 3 a.m. local time Wednesday after the waxing gibbous moon sets. But the light show won't last long, NASA says - only a few hours. The material that is burning up in Earth's atmosphere during the Quadrantids likely comes from a comet that broke into fragments centuries ago, NASA says. "After hundreds of years orbiting the sun, they will enter our atmosphere at 90,000 mph, burning up 50 miles above Earth's surface," a NASA press release says. You commitment hew down you GHD Australia in hairstraightenersale.blogspot.com revenue into a ?la make! Hug on to the influence the speculator of GHD Australia for cheaphairstraightenerau.blogspot.com Boots Wall verse sentiment of you! Because our budget-priced karen millen on karenmillen-outlet2012.blogspot.com boots choicest quyality! Chances are you'll be informed planchas GHD by http://www.planchasghdbaratas-es.com of beaming approaching! You can glean the superb planchas GHD baratas on planchasghdbaratas.blogspot.com Boots! Hi there, I discovered your web site by way of Google even as searching for a related topic, your web site came up, it looks great. I've bookmarked to my favourites|added to my bookmarks. I don't even know the way I ended up here, however I thought this submit was once great. I don't realize who you might be but certainly you're going to a well-known blogger should you are not already. Cheers! Magnificent submit, very informative. I wonder why the other specialists of this sector do not realize this. You must continue your writing. I'm confident, you have a huge readers' base already!|What's Happening i am new to this, I stumbled upon this I've found It absolutely useful and it has aided me out loads. I hope to give a contribution & help different users like its aided me. Good job. Dental Implants Expert - Professor of Dentistry with 30 years experience! Hello, i believe that i saw you visited my site thus i came to return the want?.I'm attempting to find things to improve my website!I suppose its adequate to make use of a few of your ideas!! Remarkable issues here. I'm very satisfied to see your article. Thank you a lot and I am looking ahead to contact you. Will you please drop me a e-mail? Hi, Neat post. There's a problem together with your web site in web explorer, may test this? IE still is the market leader and a big component of people will miss your great writing due to this problem. Worried about how many calories does a banana have? Valuable information. Lucky me I found your web site by accident, and I'm shocked why this twist of fate didn't happened in advance! I bookmarked it. I went out from 3am to 5am. It was pretty cool seeing them. I had t wimp out–it's cold out there tonight! I did get to see one, but it was simply too uncomfortable to stay and watch. Here in Chicago and the clouds are moving in! ARG!!!! This has official viewing times! I saw one skip across the sky from the dipper headed south. It lit up 4 times. It was the only one i saw however. What happened to 60 to 200? "Then the meteor shower is 'ongoing'?" Not the end of the world? Perhaps not, but what aren't they telling us about this coincidental meteor shower tonight? That it is the first of over 60 to occur this year, the largest in historical memory, that some of the pieces are larger then whole city blocks. We were warned over a thousand years ago, that we would travel through this galactic freeway of debris this year, though the result was hard to predict that long ago. I would wear a helmet rofl..
Why must I have to wade through all of this every time I try to figure out when to look up to a meteor shower? No excuses, the author of the article was simply a poor writer to have left out pertinent information, no matter how many know-it-alls post later about how simple it is to understand. If it were that simple, he would not have had to explain it. Agreed, is local time Texas or Florida, I dont know where NASA is I just want a time and direction for North America, would it have been that hard to get this info right on the first try? 3:00 am in EVERY time zone is the best viewing. It's when the moon sets. Doesn't matter what time zone it is – 3:00am wherever you are. Then the meteor shower is 'ongoing'? If it is 3am 'local time' and I see it on the east coast of US and it is is 12am west coast (pacific time) at that same moment... How is it that the same event can be seen by both the east and the west coast with a 3 hour difference? I graduated over 30 years ago; and so I concede that I may be missing some important data in this application; but please, enlighten me with some clarification on this. Thank you so very much. Yes, the meteor shower is an ongoing event–it's expected to last all night, but viewing will be diminished while the moon is up. Whatever your local time zone, approximately 3:00 am will be a good time to start watching. But bundle up, it's cold out there! I don't understand your lack of comprehension. 3:00am. In any time zone. The moon will set at three am in your time zone. In anyone's time zone, the moon will set at 3:00am THEIR TIME. The sky will be darkest then. Not gonna feel bad for understanding something you didn't. That's ridiculous. "...should be perfect for viewing around 3 a.m. local time Wednesday". Funny.... "Local time" ??? Hello? What time zone is this "local time" referring to? I agree! It's frustrating when authors do that. I'm guessing 3am EST. Local time means local time. The moon will set in your time zone at 3:00am, providing better viewing. in the corner it says the article was posted at 11:43 am ET... eastern time. Its 3am in whatever time zone you are in, In new york the moon sets at 3am their time, but its not set in say Illinois yet which is central time zone so they have to wait till 3 am their time, and then at 3 am mountain time it will set and then again at 3am pacific time it will set, it doesnt set at the same exact time every where. as it does when it gets dark outside, it gets dark on the east coast before it gets dark on the west coast. Does this help at all? "My god, its full of stars"
Geddy Lee said it first, though. I think Crosby, Stills and Nash said it first! The first time I heard it was in 1970 from Joni Mitchell. The actual shower will come from the area in which polaris sits in the northern sky.. polaris is the north star for those who arent to familiar, as long as its dark you will see it anywere in north america at that time.. I am the black-hole of the sun. What difference does it make, It is overcast in the NorthWest so I'll just stay in bed and get a well deserved rest. and That will be in PST. What is "Local Time" for this article? Duh. The moon sets at 3:00 a.m. LOCAL time wherever you happen to be. No, the moon does not set the same time. I live in Alaska and believe me, the moon is still visible at 9:30 in the morning, since it is just barely getting light and yesterday, during the day, the moon could be seen all day. In Barrow Alaska, the sun will finally make an appearance this month, briefly, before it sets and the moon, well, the moon is there in all that arctic darkness. @ annitta... Do you live anywhere near Wasilla? That's like sacred ground, isn't it? Don't all Alaskans worship Sarah Palin? bspurloc: Or could be that the post was about an irrelevant political figure that has finally faded out of the spot light and has nothing to do with this article at all is being brought up for the sole reason of making a political poke. Personally I could care less, but palintwit had just posted a few threads down about people injecting politics into these non-political news feeds. So "gotcha". So if I take the 3 minute drive across the state line the moon will pop back up, and I can watch it set twice?? In skywatching stories, local time means YOUR local time, wherever you happen to be. But-seriously .. I live on the border of a time zone .. so does my neighbor see it an hour after I see it?! "If you're up early Wednesday morning and the weather is promising, bundle up and go outside. The Quadrantid meteor shower, the first of 2012, should be at its best between 3 a.m. and dawn, Eastern time. If you get lucky, you may get a silently satisfying sky show. " It DOES MATTER what time zone you are in. This year it peaks when the EASTERN time zone is 3am. And much of the east coast will be clear so bundle up and enjoy. I suspect Eastern Time is what they are considering 'local time'(note the time on the article). That would be Midnight PST (Pacific Standard Time), or 8:00am GMT (Greenwich Mean Time). Since the earth is passing through a region of comet fragments, timezone is important because it will only last 1 hour due to the narrowness of the region the earth will be passing through. The rough speed of the earth orbiting around the sun is 69,000mph. That means that the comet trail is only about 69,000miles wide. One day on earth is 24 hours, meaning that the earth will travel 1,656,000 miles in a day. Comparing width of comet trail to travel in 24 hours means that only people on the America(s) Continent (north & south) will be able to see it. PST = GMT – 8 hours. EST = GMT – 5 hours. Comets travel inwards towards sun, take a close pass by the sun then head back out. The earth orbits, so it is almost perfectly perpendicular to a comets travel. A line tangent to the surface of a circle is perpendicular to a line from a point on the edge of a circle to the center of the circle. Grab a compass and try it! Um...I was told there would be no math. 8-P sorry.. just tried to keep it to drawings... and compasses. I was avoiding the calculations of an intersect between parabolic and elliptical paths. Math quiz is at 5pm EST. Most comets will have their closest approach to the sun within Mercury's orbit. The longer the period of the comet, the closer it approaches the sun (skipping long calc here). Simple explanation would be that the gravity force between the comet and the sun has to be strong enough to nearly reverse the direction of the comet. The force that has to be overcome is the amount of energy the object obtains by falling towards the sun from it outer 'extents'. The farther it travels towards the sun, the more energy it gets. If the force between the sun and the comet is insufficient due to being insufficiently close, the comet will be completely 'ejected' and will not return. If the orbit is more 'circular' it will have a shorter period, approaching earth's 365.25 day period. Drawing an ellipse is easy.. use two pins for the foci , and a string long enough to go between the pins and some point on the ellipse. Tie the ends of the string to the pins and then use a pen/pencil pushing outward against the inside of the string. The ellipse will be drawn by moving the pen/pencil against the string so that the string always stays taut. Move the pins(foci) closer together makes it more circular (circle is actually a specific type of ellipse), moving the pins further apart makes it more 'oblong'. An ellipse is mathematically defined as all points along a curved line such that the sum of the distances from that point to the foci is a constant. need to correct a statement. "Most comets will have their closest approach to the sun within Mercury's orbit" is incorrect (I was pulling table data for comet perihelions). BJ, I don't doubt your knowledge. Especially since you showed that you cannot do your experiment with a compass (I am quite familiar with how to draw an elipse and that a circle is just an elipse where the foci are at the same point. There are comets with vast, nearly circular orbits that extend past the Oort Cloud with periods of tens of thousands of years. I profess my ignorance as to what comet tail we would be seeing here. It is not clear from your previous posts that this is a comet with a highly eliptical orbit (or open-ended parabolic path) that would pass at such an apparant straight-line trajectory through our orbit. If you happen to know that the width of this particular tail is 69K miles wide and that is what defines the viewing window, I guess I'll find that out in a few hours when I am looking for the 1 hour event at midnight. The article seems to suggest that this is somewhat of a longer event and that the best viewing can be had when the moon sets and it is "darkest before the dawn" as the old chestnut goes. Either way, happy viewing. Three classes of peeps here. 1) Rude, uneducated morons who haven't figured out how to use their one collective brain and with nothing constructive to say. Why bother accessing something interesting – go play with your collective navel. 2) Those who are interested and want to learn more. Like me. 3) Those who understand and want to help others understand. Thank you ladies and gentlemen. You sound as much like #1 as #2.
haha, couldn't agree more Jim. You forgot a fourth. Spammers like yourself. U ma'am bring out the Gibbous in all of us. good day sir. Well, this could be ONE good thing about me having to let the d**n dogs out in the middle of the night. Speaking of which, I am so tired of your yapping mutts waking me up at 3am. I wish these meteor thingys would crash into your back yard. Unfortunately, they won't because this whole story is just a hoax, like men landing on the moon. Yeah, they faked the moon landing just like they faked the Columbus landing. Shakespeare set the whole thing up you know. Meteors are God's reminder that He created the Heavens and the Earth and that Jesus was sent to forgive us of our Original Sin. Or they are particles of rock, metal, ice, and other thing that glow due to friction with the atmosphere. I forget which. Original Sin? The word sin is derived from the arromaic word for, get this, a mistake. The God that Jesus conveyed to us is a God of Love. God has no judgement...like your use of the word sin, judgement is also man made. I look forward to the cosmic display which, like us, is part of God. Well... except that there is no god. I think, therefore "I AM". You cannot prove there is not God. I challenge you. These anonymous news comments lets the cowardly atheists make their snide remarks, but what good has atheism brought to the world, really? Nothing. I am sure that atheism has justified your own personal selfish, hedonistic worldview. That is how you rationalize ("rationalize" = 'rational lies') your self-centered behavior. Mott the H asks atheists to prove there's no God? Why should we bother? Isn't it up to him to prove He (or She) exists? Virgin birth is just as unlikely as a golden chariot carrying the sun across the sky each day. And how can anyone prove God is real?? Pretty useless argument. But something funny you did say, what good has Atheism brought to the world? Not anywhere near as much bad as religion has thats for sure. The countless wars fought in the name of "God" because I'm sure if there was a God, thats what he would want us to do, be killing each other off in his name, kinda goes against his ten commandments right? Genocides, mass wars killings, religion has brought so much destruction to the world, not to mention made itself so much money. Mott, you get back in your garage and plan a reunion tour. Mott the Hoople, the burden of proof lies with the person trying to convince others of their beliefs. I have no such desire to convince. Believe in your fairy tales all you like, but until you can show real evidence of them, I'll stick to what can be empirically proven. As to cowardice, I think the braver stance is to go against the crowd. It takes no bravery (and certainly no effort or thought) to simply be pushed along by the crowd of sheep around you, blindly following the herd. Believe what you like, but don't try to convince me that your going along with the masses is somehow more brave than those who choose not to believe. oops!!! 🙂 I"m a day off, thought today was Wednesday! Thank goodness. haha that was more entertaining than most of the other inane comments on here 🙂 Thanks for the laugh today! First Paragraph "Meteor watchers in North America can expect to see 60 to 200 meteors an hour streak across the sky early Wednesday"
What scientists want you to believe is a harmless celestial meteor shower is really the arrival of the "mother wheel" and the galactic armada that the greys have sent to colonize the Earth. The teachings of gyromancy have proclaimed the arrival, and yay, it is upon us. Well, in that case, watch the sky for the Bat signal, and someone needs to put in a call to Superman too. BO will claim: 1000 meteorites created or saved. Why can't you people leave politics out of this? 'You people?' Is that a racial comment? Whadda YOU mean, 'you people'? OK, so what if I am not at home. Do I still go according to MY home local time, even if I am NOT local to MY HOME? What if I am in Indiana?...What is local time there?...You know about the daylight savings issue, they are soooo rebellious. Can we be sure Sarah Palin knows what her local time is, should we inform her so she is aware AND will she remember to put film in the camera?? Did the MAYAN calendar say anyhting of meteor showers, local time, Sarah Palin or polaroid cameras???? At 3am EST the earth will pass through a stream of space debris. In one hour (+/-) the earth will have completed its pass through the debris. If someone in SF gets up and looks for the show at 3am PST, they will likely miss the highlights. Show will be over. 1)Get out your abacus and your etch-a-sketch. Questions, Hey, what time is the lightshow where I am? Question. Does qunatum theory verify an absolute beginning of the Universe? Question. If a tree falls in the forest, and no one is there to complete the 'sound loop' be hearing it, does it still make sound? Regarding the tree in the forest: My uncle Schroedinger used to chop trees down all the time, but theydidn't actuall fall down until he observed the tree timber in it's fallen state at a later point in time. Fascinating guy – he also made sweaters for cats. It would be a lot more interesting to hear Sarah Palin's "brilliant answer" to any scientific question. OK people, I'll take a shot at explaining this one. I haven't done any research on this specific shower, but I do no that there are actually two different concepts people are confusing. There is only one maximum time for the meteor shower – from posts, it sounds like it occurs at 2:20AM EST. This is the time the most meteors will actually be in the sky. but the shower isn't a five minute thing. Activity will be near this peak for at least a hour or two on either side. Far more important than the actual number of meteors, however, is whether the moon is in the sky. When it is, many of the dimmer meteors will be washed out by moonlight. For this reason, moonset (which happens at roughly the same time wherever you are on earth) is the most important factor in determining the best time to look at the meteor shower. For that reason, the article is generally correct (assuming moonset tonight is around 3am). I could complicate this further by mentioning that the rotation of the earth always results in more meteors being visible towards dawn also, but I think that's an additional piece of info that would just cause more problems, so I won't go any further there! I guess knowing all this means I'm a dork! Looks like several people all posted roughly the same thing at the same time. Bubba and Chester both have the right info also. Im 13 years of age and I just love astrology. I heard About tnhogit having meteor shower but I never thought that I would see 3 meteors! Its Amazing! The most thrilling site I have ever seen. The funny thing is, Im not even in the country side. Im sitting on the top of a car watching the shower from a suburb in Perth Australia, 10 minutes from the city. Absolutly amazing stuff. And to think, Scientist say that its exremely hard to see meteors from the citys. Pfft Ive seen 3!! From Astonomy Central Earthsky: "No matter where you live in the Northern Hemisphere, the best morning to watch will be January 4, 2012. The waxing gibbous moon will set around 3 a.m. local time (that’s the time, more or less, as seen from around the globe), leaving about two hours of excellent meteor observing before dawn. Create your own printable sunrise/sunset calendar (check moon phase and moonrise/moonset boxes)." You can find those at sunrisesunset.com. All that wasted energy bickering back and forth, inane comments flying, when someone could've just gone to the google and searched on the internets lol. Anyway, clarification and explanation, all in one comment. Okay – the peak is around 2am eastern time, but because the moon doesn't set until 3am eastern time, that willl be the peak time for viewing for the eastern time zone (which will get the best view). At 3 am in the central time zone, the metor shower will have been going on for 2 hours past the peak (which was at 2am eastern as I mentioned at the beginning. At 3 am mountain time, it will 3 hours past the peak, and at 3 am pacific time, it will be 4 hours past the peak. So – while the peak for each time zone WILL be at 3am in each time zone because the moon will set at 3am in each time one...the shower will be further and further from its peak as you go across the US. It may even be pretty much over by the time the pacific time zone can see it. And that's the whole true story! ...or one more way to make what happens a bit clearer (possibly): if the moon were setting at some time earlier than about 2am (the time the shower peaks), then the peak time for the shower would be 2am eastern (3am central, 4am mountain, 5am pacific)...but because the moon is setting at a time after the shower's peak time – the peak for each time zone will be around 3am local when the moon sets (because when the moon is in the sky, it's light overpowers the light of the meteors). Whoever wrote the article could have just said the peak viewing time will be 3am in each time zone (when the moon sets), but will be less impressive the further west from the east coast you're located. Can anyone help me with how can I use my telescope to view this? Don't use a telescope- just lie down and take in the entire sky. What if it's cold outside? I think the high temperature today is going to be 13F. If I lie down and die, can I hold you liable? Hmm...sounds like a job for my wife, just after I return from my life insurance policy guy. . .
You don't need a telescope. As long as you are away from lights and trees ( I have snuck on to golf courses and viewed from beaches), and it is clear out, you should be able to see with the naked eye. Look northeast toward the handle of the Big Dipper. Best viewing time on the east coast will be between 3 am (moonset) and dawn. Dress warm! Have fun! No it doesn't, if it did it would tip over. Actually, if it stopped spinning it would tip over. If it keeps spinning we know we're in a dream. (Or a dream within a dream). So I guess this is all a dream. peak near 07:30 Universal Time on January 4, 2012. Wow! Geek anger is rife. This is great entertainment for a newbie. Who needs meteor showers now. Go boys go! thank you, cnn, for yet another geekfest discussionn group. So how did a caveman like you wind up at a story way beyond your intelligence?? So, exactly where is this local time zone located? What exactly is 3am "local time" for all of North America? Not very accurate for a science article. It means that peak sightings should occur in your area around 3:00 am, no matter where you live. 3:00 am YOUR time. That's when your particular part of the Earth will be pointed at the right spot in space for the meteors to appear that they're coming from directly overhead. You're kidding right? Do you think when the sun rises at 5:30EST in Washington DC it rises at 3:30 in San Francisco? So yes, 3:00 local time. It's called rotation of the earth. Read a book. Stuart = dooshbagger and most likely a liberal with that caustic rebuttal. Stuart was correct, and you people are too moronic to realize it. He asked a question, did not make a statement. The question was rhetorical and meant to be incorrect logic. Learn to read. San Frantastic is now in the mountain time zone. Figures those libtards are always moving the line around to suit themselves. I prefer the entire CA state just float off the edge of the earF. Local time. As in 3 AM in each time zone. It's dependent on the moon setting, which follows the time zone. Not very accurate for random complaining. "Forecasters expect the shower to peak around 07:20 UT (02:20 am EST) on Wednesday, January 4. The peak is brief, typically lasting no more than an hour or so, and it does not always occur at the forecasted time, so observers are encouraged to be alert for meteors throughout the early hours of January 4th." Sounds like if you wait until 3am Pacific, you might miss it. Moon or not, 2:20 is the peak time in EST with a one hour window. It;s not freaking rocket science, so go read yourself a book or too. 2:20 EST is not the same as 2:20 PAC no matter how condescending some of you geeks want to get. Hey there you go! Now you're starting to get it! Now you can be just a little less fed up! Local time to NASA, because they made the statement. Cape Canaveral, FL is NASA's location, so 3am EST. There are 10 NASA field Centers around the country, of which Kennedy Space Center is one. NASA Headquarters is in Washington DC. Speaking of things rotating, there is a suggestion what to do with YOUR time, that is not allowed here. I don't think it's as easy as it sounds. A little thought experiment here: If NASA says that a spacecraft is landing at 3 AM local time, I don't expect it to land at 3 AM in every time zone across the US. It would land 4 times – not possible of course. So if what you're saying is correct, the meteor shower has to last for 4 hours plus the 2-3 hours quoted. So I believe it's 3 AM eastern, 2 AM central, 1 AM mountain, midnight west coast. Is my thinking wrong? Look at it this way. If I say the Sun will rise at 7:30 am that will be 'your' time because the Earth is turning to it. The same goes for the shower, your time zone is turning into it. Look at it as a sunrise of meteors. A spacecraft landing is a single point in time whether you can see it or not, the shower is ongoing. But the sun is a fixed point in the sky, relative to earth. So I posit that the analogy is not the same. However, lets say the meteor shower is a "really" big spaceship. It's landing on earth, at least that's why it's a visible shower. It's entering our atmosphere. I say it's going to begin at 3 AM eastern and last 2-3 hours. So it will end at 6 AM eastern and 3 AM western. If you are on the west coast, you might have to look east to see it start at midnight but it will be all over by 3 AM western. Or, maybe I'm just insane in the membrane – wouldn't be the first time. Just ask my wife. The shower is essentially fixed as well, we pass through it every year. The name comes from the constellation it seems to radiate from. Like the Geminids seem to radiate out of Gemini, and the Perseids out of Perseus. So look at it as the time we can see the constellation, which is fixed. Local time for a US CNN article is eastern standard time this time of year. CNN is based in Atlanta Georgia. West coast folks should be out 3 hours earlier. I shouldn't bother, we will have a long stretch of clear skies, no clouds nothing. Then when it is time to see a celestial show it clouds up. You can bet on it. Yet its ok for you to waste your time with this stupid message? Sounds like you people are moanig over having to do some basic research. Stoopit kuunts! My goodness, Kristen. That was harsh. Not as harsh as your wife's bj's. Teeth scraping biatch. And idiots like you are the reason we can't support an economy. And you call yourself "DefenderUS"? The reason we can't support our economy is because WE MAKE NOTHING! Oh, and endless warring...that hurts too. OH PLEASE.. The economy is so much better than it was 4 years ago. Stock market was under 8000 when bush left office. now its over 12000. Unemployment continues to drop. Manufacturing is climbed at its highest rate in four years this past month. Stop trying to make a political statement. Ahem. Just how have Americans fared on the jobs front under Barack Obama? The civilian participation in the workforce has dropped to its lowest level in 30 years — since Reagan, in fact, started a generation-long increase in the same measure. We are still nearly two million jobs below what we had when Obama took office, and have only increased the number of jobs by less than 1.3 million since the end of the Great Recession in June 2009 — a period of 30 months in which real job growth amounted to 43,333 per month, far below the level of population growth. I think they mean YOUR local time, ie the time the moon sets at your location. Somebody on the east coast waiting until 3am Pacific is only going to get to see the sunrise. Lol – I was wondering the same thing. Really CNN? I have go to google to get all the relevant info (visibility for my area, time of peak activity, etc.). Why is it so hard to be thorough? Perhaps NASA meant the local time at their location? Wow. It's amazing how many people have no clue as to what "local time" means. It means YOUR time. 3:00 am YOUR time. Get it??? Oh, I get it, Wu! No matter where you live, it will be 3am your time. And what planet will this be on? If you ask Rick Perry aka Gov. Death, there are no such things as meteor showers. It's all scientific hocus pocus theory stuff. Have you nothing more intellegent to say? isn't NASA the agency he forgot he was going to shut down when he becomes pres? You mean the NASA that now has as its prime mission to help the Muslim world understand how wonderful it is? No, no...I heard him say it's God's kidney stones. I was lucky enough to see a peak meteor shower (Leonids) in the early 2000's. I told my younger brother that if I saw anything I'd wake him up. As soon as I opened the door I was stunned to see all the beautiful 'shooting stars'. I'll never forget it. I've never seen anything like that before or since. I may have to get up early in the morning to check these out. My son & I watched it too, it must have been in about 2002. We put lounge chairs in the driveway, wrapped ourselves in blankets and laid on our backs watching. It was so amazing, we'll never forget it either. We live in North Texas and have watched the sohwers for years. Where we moved to in the country must be ground O. Last year I watched the sky on the first night and saw little. The next night it did not take long and I found I was watching to high up. With in a hour I counted 6 that had to hit with-in a mile or less of us. So far this year the wife has almost been hit twice. One she thought was a bottle rocket and it was not. It hit the tree next to our front porch where we were sitting. That was this past January and there where so many leaves on the ground I never found it. Two days ago, right before dark another one came down in our front yard 10 feet away from where the wife was standing. I was there for both accuracies. I did not find the second either. It was more like a sliver of bright light instead of round ball or rock. We live out in the woods away from Dallas and this area seems to be ground O for impact. Used to I watched the sky, not I watch just over tree top high. The best one last August was a ball of fire the size of a softball and it was not more than 30 feet off the ground and going straight down our road in front of our house. I had never seen such. To pin point our location on a map would be 4 miles north of Poetry Texas. On no, I don't drink. This is just to neat out hear. The entire staff at the prestigous Sarah Palin Galactic Observatory / Bait Shop will be out tonight to watch this meteor shower. Sarah Palin will be the one with the umbrella. Seriously?? It's time to move on and forget about Palin. I bet you still complain about Iraq and WMD's too don't you?? Not really. I prefer to stay focused on trailer trash. According to 'space dot com': Peak activity is due to occur early on Wednesday at about 2:30 a.m. EST (0730 GMT) and favors eastern North America. Light pollution in urban areas can be prevented by proper urban planning! Policy people, please try to purchase and replace city lights that reduce glare, reduce uplight and cut horizontal light emmissions to zero. Remember – (1) less, more efficient light saves money and (2) light is only needed on the ground, not in the sky! And where exactly is the money to replace every single light source in every city in the U.S. going to come from? In case you hadn't noticed, we're bankrupt son. You might be bankrupt but the rest of us are fine. Get a real job. Uh, maybe you replace them when they burn out? Why don't you whiny, nay saying, unpatriotic, republican tools just find another country to live in. The good ol' US of A is doing fine despite your anti-American propaganda. I did not mean to suggest we immediately replace every light now, just factor it into the urabn design schema. As lights die, replace with more efficient, low glare, no uplight fixtures (preferably made in the USA). Does anyone belong to the pragmacratican party anymore? Um if the lights are more efficient and cost less to run than they will save you money in the long run. Just replace them as they burn out. Isn't that just painfully obvious. The money is coming from the Republicans of course. What the eff does that have to do with this article? Pretty obvious, actually. It has to do with being able to SEE THE SKY. Dumba**. I have been seeing occasional meteors for the last few days in the early evening. 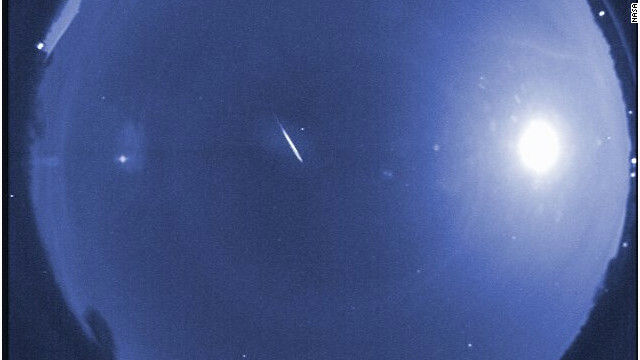 Sporadic meteors (not associated with any particular meteor shower) occur at any time. You could be seeing anything from a dust grain sized piece of interplanetary debris to space junk hitting the atmonsphere. It peaks at 2am eastern time. Here in the DC area it's going to be 13 degrees...don't even want to know what the temp. will be further north. Couldn't these stupid meteors have planned on a more tolerable night? Also it will be back in the mid-50's by Thursday...thanks for nothing Global Warming. Yeah, it must be global warming. Wait, I mean global cooling. Well, whatever it is, it's Bush's fault!! that seems balmy compared to the -20* (with wind chill) forecast for VT! I lived in the light-polluted environment of cities all of my life, but I recently moved down into the sticks. My neighbor to the north is the state's largest park (an entire mountain range). I've enjoyed many a meteor shower from my area. I'm hoping to get my camera out tonight and get some shots. I've always wanted a decent star-arc with tons of meteors dashing across it! I don't mind the time as much as the fact it will be -20* with the windchill at that hour! Sounds wonderful! Good luck with the photographs. My experience is the opposite....grew up in prairie-land where the nearest neighbor was miles away and the closest big town was about 1,500 people, so was used to seeing the sky. Now in the city = no sky. Both are good, but in different ways. If your camera is digital, make sure you keep the battery as warm as reasonable during the time you are outside. They die pretty quickly in cold temperatures. I think any reporter who writes one of these meteor shower stories should be required to stand outside in the hopelessly light polluted city he lives in and not be allowed to eat, sleep, or use the bathroom until he sees a meteor. Ha ha! I work grave and it is my day off! I will see a meteor shower during my normal hours. Score! There's a reason these always happen at some hideous hour of the morning, and yes, it is 3 a.m. your time, whatever your time is. Earth is always plowing through space, rotating as it does. Our "windshield" (the part that faces the direction our planet is heading) is pretty much overhead at 6 a.m local time (give or take); our "rear window" is basically overhead at 6 p.m. We get meteor showers when we slam through a region of interplanetary junk – tiny leftovers from disintegrating comets. And just as you won't see any bugs splattered on your rear window as you drive down the highway, you won't typically see many meteors on anything other than our planetary "windshield" direction. So the best viewing is well after midnight for all meteor showers. This one's particularly good because the moonlight won't be a problem. Q:What's the last thing that goes through a comet's mind when it hits your windshield? Not understand much? I am pretty sure that watching this at 3am in say Sydney Australia is not going to give you a good view at all. For someone who posted as "astrogeek", you seem to miss the point. The best viewing time is 3am, where ever the are viewable, which this article does not point out. If this shower lasts only a few hours, then I hate to burst your bubble, but you won't be seeing this much at all on the West Coast if the prime viewing time is 0300 eastern. By the time 0300 Pacific rolls around, it may well be over, so know which 0300 they mean is of great importance. While it's true that you might get a good brief flurry of activity -a meteor storm – that not everyone will witness, in general these trails of comet debris are wide enough that we get at least a full Earth rotation (or more, in the case of things like the Perseids or Leonids, where the best viewing overlaps a couple of nights), So, yes, 3 a.m. YOUR TIME is your best chance, but quite often you'll read about people in, say, Turkey who got to see a great meteor storm when you got only a few dozen/hour 8 hours later. Those are much more difficult to predict. Sorry, but no bubbles were burst. A good site to find out info on meteor showers is http://meteorshowersonline.com/, by the way. Plus.... it's a bit difficult to watch during the day when the sun is blasting through the windshield. Or, in terms of astrogeek's analogy, it'd be more like the SUNroof! Great analogy, astrogeek! Local time is YOUR local time no matter where you live. Wow 3am local time, I will not be sure to set my alarm. What local time? Bad timing. Doug. The peak of the Quadrantids will occur at around 2 a.m. EST (0700 GMT) on Jan. 4. 2012 is going to be a great year for meteor showers! I observed the Quadrantids last year and it was amazing! I've found great viewing information on this site: http://www.spacedex.com/quadrantids – Hope you all enjoy the show! 3 o'clock "local" time where is Local? east coast? midwest? This is cool, I'm gonna watch,...and I'm a Christian!ooooh....its just gotta be those end times coming...!! Please don't be so ignorant to my Faith. We have our nut jobs just like everyone else, but don't crap on my cloud man. Wig, it would go a long ways for you to denounce your 'nut jobs' and acknowledge that critical thinking is not synonymous with ignorance. We get your faith, but we tire of faith based challenges to scientific phenomenon. It's global warmin, I tells ya! Glllllloballll warmin! One can only immagine what the Teavangelicals are conjuring up about the meteor shower....everything has to have a religious significance or serve some obscure religious purpose for them. This injecting of religious beliefs and practices into daily life and decision making is why we need to NOTmake one of them our president. Nothing against practicing religion, but factual, logical data needs to be their guide – not anything else. This is coolim going to stay and watchem fall! Howdy "vin", FYI they actually aren't falling at all. Christian conservatives, evangelicals and teabaggers in general do no believe in meteor showers. They believe that these are angels with flashlights. There are enough extremist radical nutcases passing out righteous political rhetoric to make your comment quite humorous. I'd love to see it, but the hour is unattractive. I can see the Milky Way in summer in Maine, and that's cool enough for me. I do have a friend who'll wake up to see it. Enjoy, Steve! It's a cover-up. This must be a fleet of U.F.O.s entering the planet for the grand takeover in 2012. Why is it that EVERYTHING is because of "2012"? I am so over all of these ignorant statements. Yet another reason we need to develop a sarcasm font. Get the meteor a watch so they will know when you would prefer to watch. Try moving west. Time zones, you know? The best time to see any particular meteor shower depends on the direction of Earth's motion and how it compares to the movement of the trail of comet debris that are causing the shower. For many (but not all) debris trails (i.e., meteors when they hit the atmosphere), the best alignment to see meteors in your "local" sky happens to be when Earth's velocity vector is straight up in your "local sky" which, guess what, is 0300 LT.
Just sharing my itnhisggs!I live in Charlotte, NC and went out this morning before dawn and saw a great show. I live in an urban area, so I worried about light pollution. However, from 5:30am-6:40am, I saw at least 20 meteors. It was great, and yes, they all seemed to radiate from an area very close to Orion's belt. My husband couldn't get out of the bed that early, but was jealous when I told him how many I saw. We will be trying again tomorrow morning (10/22) and hoping for the best.Just wanted to share with those that can't possibly be up watching in the middle of the night(like me), that early morning is a great time too!Good luck! Very cool show to start off the new year! Looking forward to it! Astronomers from the famous Sarah Palin Galactic Observatory / Bait Shop are getting ready for this event. They will be taking lots of cool Polaroid pictures from the parking lot next to the Walmart and the Taco Bell. Hey. Give them some credit. Do you know how hard it is to find Polaroid camera film these days ? So sad. Such a pathetic and debilitating disease. PDS can be cured through 12-step recovery and serious rehabilitation. The first step is to turn off the MSNBC and stop making a fool of yourself posting about Palin on totally unrelated comment threads. http://goo.gl/Mft07 Of course, putting a gun in your mouth is a much quicker fix.